My mother-in-law makes a delicious spaghetti dish that actually doesn't have any spaghetti in it at all. It has all of the traditional spaghetti ingredients, but sits on half of a zucchini. It is yummy, which is why I immediately knew this grilled zucchini pizza from Kalyn's Kitchen would be delicious. How I just have to find a zucchini that is big enough! 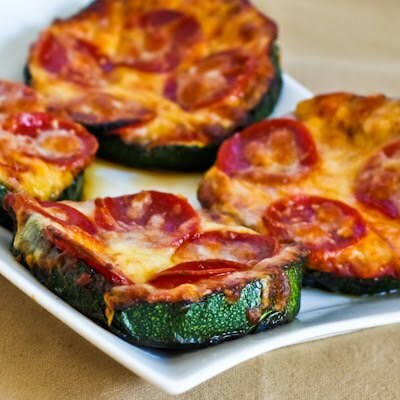 You can get the recipe for grilled zucchini pizza slices HERE. It makes me hungry every time I look at it! Hmmmmm, looks interesting. Wonder if my kids would even try this? This will be in my belly this week. Oh pure genious. I do hope you enjoy it! And I have "zucchini spaghetti" on my list to try! Kalyn, I can't wait to see what you come up with! !